Middle East, What Cinema Can Do, a biennale event, celebrated its 7th édition in 2015. 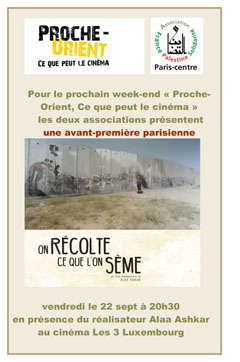 As president of the event, I founded the festival 14 years ago with films focused on Palestine and Israel. By the second edition, Carol Shyman became my partner and very quickly thereafter we extended the scope of the event to include the Middle East from Iran to Libya, notably the Levant. In 2016, we decided to decentralize and opted for a new format revolving around weekends in Paris and elsewhere in France. Middle East, What Cinema Can Do was invited to Grenoble, Nanterre and Lille last year, and in collaboration with Ciné Palestine in February, we went to Toulouse. We have been invited back to L'acharnière in Lille in June 2017 with a program of Iranian films. The Paris weekends began in March 2017, held in our habitual venue at the newly refurbished cinema Les 3 Luxembourg, located in the Latin Quarters on the Left Bank. The debates will continue to be orchestrated by Dominique Vidal, former managing editor at "Monde Diplomatique". Our intent is to propose to Parisians 6-8 weekends per year where they will have the opportunity to discover avant-premier soon-to-be-released features and other films not generally available via traditional distribution in France. In Between (aka Je danserai si je veux) by Palestinian Israeli director Maysaloun Hamoud was greeted by an almost full-house and peaked interest in the younger generations of Palestinians living in or near Tel-Aviv. 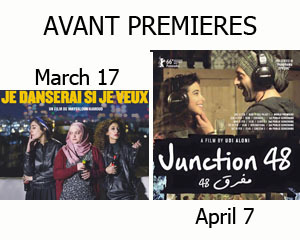 In another look at these young people, Middle East What Cinema Can Do will show the avant-premier of Junction 48 by Udi Aloni, Israeli/American filmmaker who defines himself as a Jewish Palestinian. We decided to give him Carte Blanche for the weekend from April 7-9; in his presence, audiences will have the opportunity to discover 3 other of his works: Local Angel, Forgiveness and Art/Violence. His films are regularly presented at the Berlin Film Festival; last year Junction 48 won the Panorama Audience Prize. 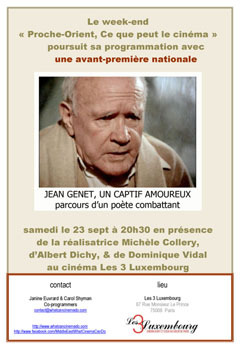 The above screenings will be attended by Udi Aloni, philosoper Alain Badiou and journalist Dominique Vidal. We are also happy to announce that our book "Israéliens, Palestiniens, Les cinéastes témoignent" published by Riveneuve is soon to be reprinted and we hope to have the English version available this summer. And lastly, a new website is under construction so as to keep you informed on the latest updates. Despite the fact that Middle East, What Cinema Can Do opened its doors one week after the tragic events of November 13, 2015, our 7th edition welcomed its largest crowd ever. Friday, November 20, 2015 at 8pm, only one week after "the drama" that hit Paris. Few people entering the theatre. Then all at once, they start coming in, slowly but steadily. The small arthouse cinema The 3 Luxembourg is soon packed. For our opening night, Leila Shahid and Dominique Vidal will be present to debate: Which Levers to Pull for Peace in the Israeli - Palestinian conflict? following the film screening of Canadian-Palestinian documentary The Wanted 18. Najwa Najjar's second feature film will screen Saturday night, 28 Nov, as part of the final debate evening that focuses on Palestine – The Water Time Bomb.